Today, Texas Governor Rick Perry announced his intention to run for President of the United States in Charleston, South Carolina. 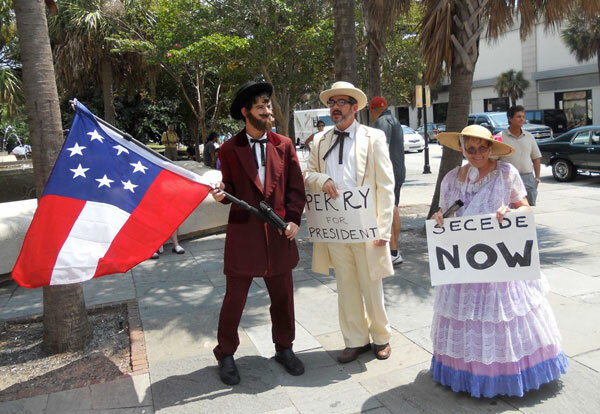 In response, SC Forward Progress facilitated a satirical rally on behalf of Perry’s campaign comprised of the “last three Confederates” who love Perry’s stances on secession and states’ rights. Over the years, Perry has made several statements that seem to advocate that Texas should secede from the union again, and frequently calls for ‘states’ rights’ which was a battle cry for original secession advocates in the 1860’s and then again by those opposing the civil rights movement in the 1960’s. Charleston, SC is where the Civil War began in 1861 and also where the original articles of secession were signed.